I had not realised that the newly reopened Fox Theater is so huge. It has a capacity of 3800, standing downstairs, seated upstairs. 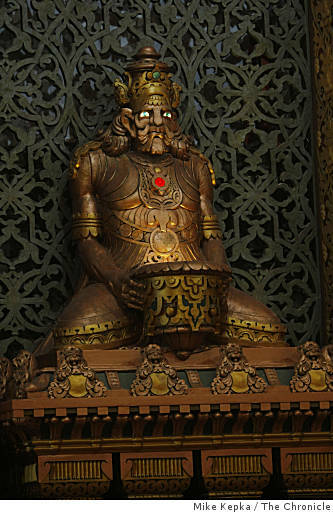 The moorish decorations are cool, I particularly liked this deity which reminded me of the cover of the Dungeons and Dragons Player's Guide. After having previously seen Nirvana and Sun Ra as support bands for Sonic Youth I was careful to be on time to see Awesome Color. They seemed a bit small in this venue, perhaps they should have huddled more. They were super polite and kept giving respect to Sonic Youth. Their best moments are when the guitarist wrestled a small monitor against his guitar. This made a delightful squealing until an electrical problem cut out the sound. That never happened to Jimi. Later there is some more play with the monitor which seemed to involve standing on a guitar. I am not too old to enjoy this sort of thing. The audience is mostly white and fairly young. There were a few children, I saw a ten year old wearing a Sonic Youth tee shirt I used to have. This is my fourth time seeing Sonic Youth. They now have a permanent bass player and so Kim Gordon alternates between bass and guitar. This means sometimes they have three guitarists. It is a Rule of Rock that no band with three guitarists is any good, but Sonic Youth have smashed that rule forever, they now sound better than at any time before. People have complained about the sound at the Fox but it was clear and I could hear each guitar separately when they played those pieces with chained chiming bits. As well as the pretty tunes there are the superbly executed surges of ecstatic noise. Most of the songs are from their last two CDs. At the end they play more of their earlier punkier stuff. 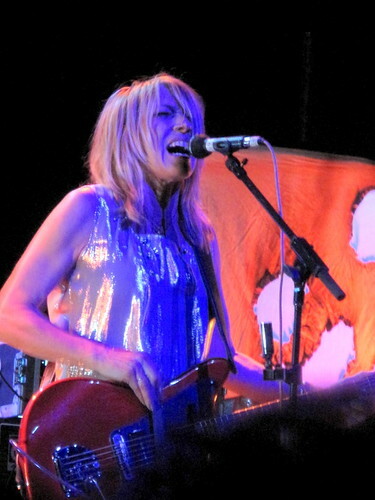 No review of Sonic Youth is complete without a picture of Kim Gordon. I tried to write about her but it sounded all gushy and I have deleted it. I will just say that she is an admirable figure. Seriously though, sounds like a great gig and I love the new SY album. Also, I know exactly what you mean about Kim Gordon. I hold similar feelings for Kim Deal of Pixies.